We’re having a lot of rain here in Wales at the moment. This always makes sketching a challenge, especially if you use watercolour quite a bit, as I do. Nevertheless, a dousing of rain does tend to freshen up the landscape, gives the waterfalls an extra zip, and can create exciting puddles for our foregrounds. Even flooding, desperate as it has been here of late, has at times changed the scenery so drastically that I have on occasion managed some fascinating, at times dramatic compositions in these conditions. It pays, therefore, always to have our sketchbook and camera on hand. 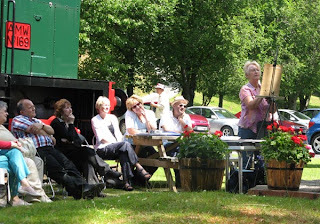 I’m hoping for plenty of sunshine next Saturday as I shall be giving a talk and demonstration at Erwood Station Craft Centre, and as Jenny Keal is doing in the photograph, it would be great to do it alfresco to the sound of birdsong and the laughter of Llandoddies in the woods. It’s a lovely venue, especially in summer, with the River Wye flowing past, and the centre itself crammed with paintings, crafts and all manner of interesting things, where you can be served tea and cakes in a delightful atmosphere, the most wonderful watering-hole between Cardiff and Colwyn Bay. Come rain or shine, I shall be there illustrating watercolour techniques and signing copies of my latest book, Skies, Light & Atmosphere, from 2pm onwards on Saturday 14th July. The event is free to all, though we will be delighted if donations, however modest, are given in aid of the Wales Air Ambulance and Help For Heroes. For further information telephone 01982 560674 or check the Erwood Station website at Erwood Station Craft Centre. The Centre can be found about half a mile north of Erwood village, by turning off the A470 to cross the Wye onto the B4567. It is well signposted. 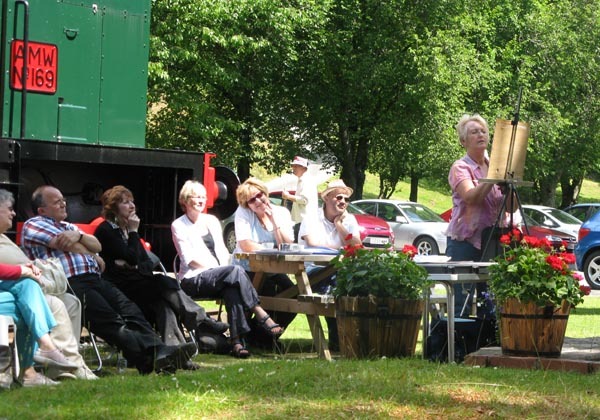 This entry was posted in David Bellamy, watercolour demonstration by David Bellamy. Bookmark the permalink.